Alphabet Ideas: The Letter L Activities! WHAT WE DO - ACTIVITIES: Hold up your Left hand and your right hand. Stick your indes finger up in the air and your thumb out. Notice that the Left hand looks like an L to the person holding it up and the right hand doesn't! This is a great way to remember Left and right. Learn about Lions - Lions fascinate most kids (almost as much as dinosaurs). During L week, why not Learn about Lions. Visit your local zoo or wildlife park. There are lots of good books about lions (and of course, the Disney Movie Lion King!). 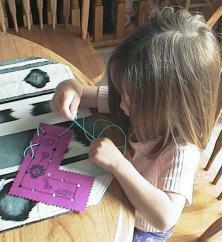 WHAT WE DO - CRAFTS: Lacing is great fun for young children. 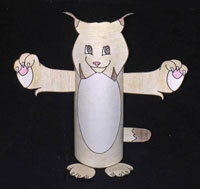 Draw a simple item on cardboard (old cereal boxes work well!). Use a hole puncher around the edges for lacing. Use a shoe string, piece of string or piece of wool work great (put scotch tape around the string or wool to make lacing easier). To keep from losing them tie one end securely to one hole. YOUNG CHILDREN: Do your lacing with the image in the center of a SINGLE rectangle piece and lace the single image (younger children). 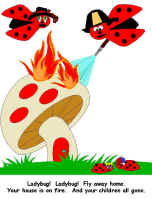 OLDER CHILDREN: Draw and cut out two identical shapes. Punch holes around the edge about 1/2 an inch in and lace the two shapes together. You can leave an opening and make it into a purse/holder or you can stuff it with crumpled newspaper before lacing it up completely to make a model to hang from the ceiling. 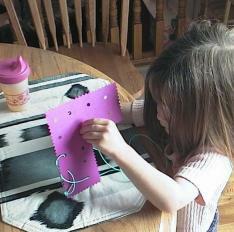 Here's Kaitlyn doing her Letter L lacing project!